Ben Brown, the owner of So New Media, had an interesting problem on his hands. 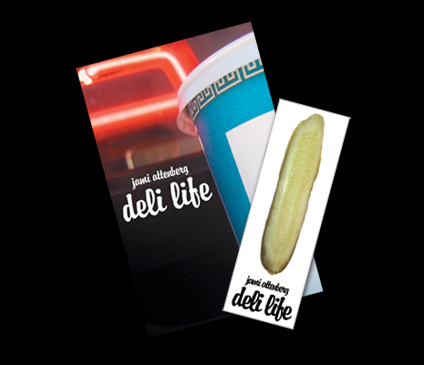 SNM was getting ready to publish Deli Life by Jami Attenberg, a collection of short stories all about New York delis. The problem: how to bring the feeling of a NYC deli to a small book? The solution was a multi-pronged approach. The cover is a close-up shot of a cup of coffee, the back cover is a montage of photographs from delis, and each chapter begins with a photograph of some object usually found in a deli (an OPEN sign, a sandwich, et cetera). But we weren't finished there. The defining touches were to be found in the packaging. Each copy of Deli Life is delivered wrapped in wax paper, just like a deli sandwich. And, bundled with each copy, is  of course  a Deli Life pickle bookmark. If you'd like a copy, the finished product is available for purchase from So New Media for $6.00. Deli Life was produced using InDesign, Illustrator and Photoshop.